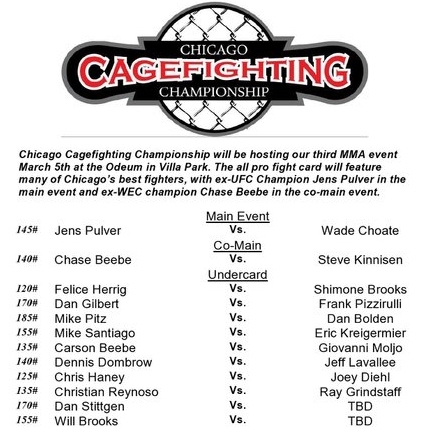 Chicago Cagefighting Championship confirmed the final two bouts for their March 5th event. Will Brooks will take on Guillermo Serment and Dan Stittgen will fight PJ Cajigas. Brooks scored a TKO victory in round one of his fight against JR Hines at XFO 38. Serment has beaten talented local fighter Bobby Reardanz, but lost in his last bout to Chris Garcia at Ruckus Invades Navy Pier. Top Notch’s PJ Cajigas has been very busy of late. He recently turned pro and his fight against Stittgen will be his 4th in just over 5 months. Stittgen fought as an ammy in the XFO and started his pro career with 3 straight wins, including one over Steve Styx at TFC 15. Chicago Cagefighting Championship just released most of the card last week. Besides Jens Pulver and Chase Beebe, fans get to see the return of Dan Gilbert. Gilbert has fought only sporadically since 2004, but he is a veteran of Shooto, XFO, Ironheart Crown and Brawl at Bourbon Street. He has fought big names like Hayato Sakurai and Frank Trigg. Now he’ll make his first appearance in the cage since 2009. Check out our interview with Dan Gilbert from November of 2009, where he tells us how he and his brother, UFC vet Joey started Gilbert Grappling. I was gonna go to this card but it looks like another XFO/SuckerPunch Entertainment event. When the Curran or SuckerPunch fighters are on a card, they usually fight scrubs. Personally, Chris Haney vs Joey Diehl should be the main event, its the only fight on the card that doesn’t look like its made special for a Curran/SuckerPunch fighter to win. In the end I’m not knocking the fighters, but I am noticing what a lot of people are not pointing out. I wont be going to any more XFO/SuckerPunch/Curran shows until things change in that group.